What do you look for when you are shopping for a piano bench? We all know that getting the right piano bench gives you the cutting edge necessary not just for comfort but to ensure that you are on top of your game playing the keyboard. There are so many factors that you’ll need to consider before choosing a bench. This can be a bit exhausting, and most people usually end up settling for less, and we are here to solve this problem. After considering all the vital elements, we have come up with three perfect benches that any piano player would ever need. These are among the very best benches and this not just based on their features and specifications but is also as reviewed by dozens of piano players who have already used the benches. So which are these benches and what exactly makes them stand out? 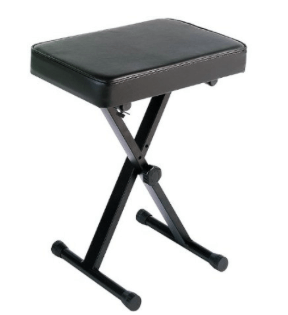 The Yamaha PKBB1 Adjustable Padded Keyboard Bench is arguably the best keyboard bench made by Yamaha. It is, in fact, the best-selling keyboard bench from Yamaha. Why is the bench so popular? Well, the PHBB1 bench offers a sturdy yet comfortable bench. This is not one of those benches that you’ll have replace after a few weeks or months. Its built is sturdy enough to support a reasonable amount of weight. One of the most significant challenges that most keyboard bench manufacturers face is meeting the middle ground where the bench is strong and is also comfortable. We all know of those benches which are strong enough but unfortunately fall short when it comes to comfort. In such cases, playing the keyboard almost feels like a punishment where all you are thinking about is getting up from the bench. Yamaha has done an incredible job in improving its comfort thanks to the ultra-thick padding. This pad comfortably absorbs the pressure from your body helping to distribute weight evenly. As a result, you can spend hours on the bench without developing any painful pressure points. Comfort isn’t just a matter of padding. There is also the question of the size and wideness of the seat. If you are forced to be extra keen on your current bench to avoid falling off due to its tiny size then its time you got the Yamaha PKBB1. This is a single seat bench, but it has been made wide enough for you to move and get the right angle for you ultimate performance. Nothing here is stopping you from changing positions if need be. Have you been having a tough time finding the appropriate keyboard bench due to your height? One of the biggest reasons behind the Yamaha PKBB1 popularity is its adjustability. This is a problem that many people face, and the Yamaha PKBB1 bench has correctly addressed the issue. With this bench, you can swiftly adjust the bench to get a perfect size that suits your specific needs. This bench can be adjusted to three different heights between 17.5” to 19.5”. This hence makes the bench ideal for both adults and children. If you’re playing a lowly placed keyboard, then you can adjust the bench low enough for you to comfortably face the keyboard. The best part? You don’t need screws or other equipment to improve the bench. It is fitted with a knob which smoothly helps you to adjust and secure the bench to your desired position. The bench will stay in this position regardless of how much pressure is exerted (as long as it is within the recommended weight limit). Heavy people can hence play the keyboard without any worries of the bench going down. Do you have a gig out of town and your heavy bench usually causes a nightmare carrying it? Most benches in an attempt to remain sturdy typically end up being too heavy which complicates portability. The Yamaha PKBB1 is made with strong but light materials which offers the strength needed while keeping the bench as portable as possible. According to Yamaha, this bench will support up to 250 pounds of weight. This probably has you thinking that the bench must be quite heavy, but it isn’t. It is a bit light and to further boost portability the bench is designed in a collapsible manner. You can quickly fold the bench making it flat which will be easier to carry and pack during traveling. Another critical aspect of a keyboard bench is its finishing. A bench could be comfortable with fantastic features, but if its finishing is substandard, then this to most people is a huge deal breaker. I mean, you are after all probably going to use it on some stage where all the attention is on you and hence getting an executively finished bench will please both you and your audience. It is for this reason that Yamaha was extra keen in ensuring that the PKBB1 is as sleek as possible. This bench is polished black which should be a good match for most keyboard and stage décor. The padded seat is also extra smooth giving the entire bench a pleasing look. Conclusively, the functional attributes of this product hugely suppress its drawback, and that’s why it is one of the most recommendable keyboard benches available in the market. On Stage KT7800 Plus Padded Keyboard Bench is an incredible product that offers versatility to users. This is one of those keyboard benches that are perfect for home, studio or gig use. That, however, isn’t why the bench made it to this list. The On-Stage KT7800 plus bench comes with some of the best features at a very affordable price. You no longer have to admire excellent benches from a distance just because your career hasn’t flourished enough for you to afford one. On stage KT7800 Plus offers professional services that should help you push your career forward. What does this bench have to provide? Firstly, comfort has been addressed with a 3-inch cushion. This thick cushion helps in offering you cozy support that will see you through hours of performance. Additionally, the seat is broad enough to facilitate angle and positional changes comfortably. The On-Stage KT7800 plus bench is also robustly built, and this benefits users in two ways. One, a strong bench always means that it is durable. Imagine how much you’ll be able to save from your budget if you could get a keyboard bench capable of lasting for years. This bench will not just be surviving throughout its lifetime. With the three-inch cushion, and its sturdy built, you are likely to enjoy its premium services throughout its lifespan. Secondly, a sturdy bench means that it can support substantial weight and pressure. This bench, for instance, can accommodate up to 360 lbs. The makers of this keyboard bench are also fully aware of the importance of customizability of a bench. Different users have different preferences when it comes to the height of a bench in proportion to the keyboard stand. This is why the On Stage KT7800 plus bench comes with a knob that allows for adjustability of up to four different heights. You can set up this bench to varying heights between 19” to 25”. The keyboard is further equipped with locks that help to secure every height position you have chosen. These locks are available at 19”, 21”, 23” and 25”. The KT7800 is also designed for musicians that are always on the road. 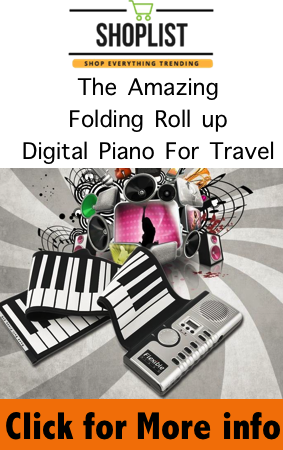 As a keyboard player, you are always likely to go from one town to another performing and having a portable bench will go a long way towards ensuring that this traveling is as smooth as possible. The On-Stage KT7800 keyboard bench is collapsible and reasonably light. The bench will hence take up a tiny portion of your trunk when you are packing for an out of town gig. Storage is also made effortless thanks to its collapsible and compact nature. Setting up the bench before a performance is also quite straightforward. The bench will easily move to reach the desired height where you can lock it before usage. On Stage KT7800 Plus keyboard bench gives you a chance to enjoy premium keyboard bench features at an affordable price. It is an excellent choice especially if you are just starting off your music career. The Adjustable Artist Piano Bench in Ebony is as comfortable as they come. This bench is finished with high-quality leather with thirteen buttons so you can imagine just how exquisite it feels and looks. This not only makes the bench appear stylish and executive but has also significantly boosted comfort. Comfort in this bench is further enhanced with a soft and thick cushioning. Your piano playing sessions no longer have to be uncomfortable or painful. This bench’s leather and duet size nature allow you to sit and enjoy endless hours of playing your piano comfortably. The Adjustable Artist Piano Bench is made of solid hardwood. This heavy-duty wood makes the bench one of the most durable you can get. The wooden stands can easily be removed in case you want to move the bench. Attaching them is also just as easy. Storage of the bench should therefore not be an issue. Between the stands and the leather top is a compartment where you can keep your musical equipment and books. Due to the heavy duty make of this bench, it is rather easy to think that it is available in a fixed position. This is, fortunately, not correct. The Adjustable Artist Piano Bench is adjustable. You can move the seat from 19.5” to 22” and hence as a player you are likely to find your preferred position. The finishing of this bench is top notch. It is available in ebony color with a breathtaking gloss finishing. This bench will honestly look perfect wherever it is used be it on a stage or in your house. 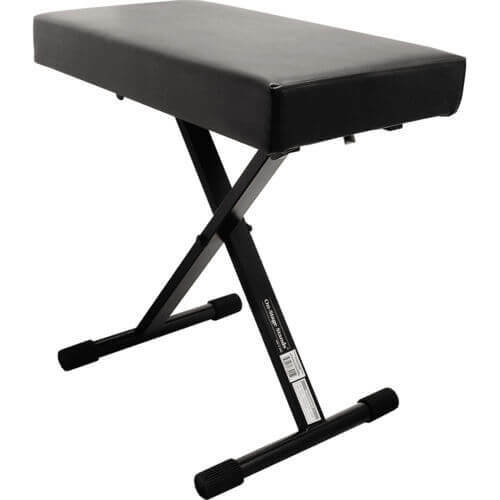 Adjustable Artist Piano Bench is an excellent choice mainly if you are looking to use it with a fixed piano. The bench is super comfortable, and its finishing alone is worth every penny you will spend on it. Adjustable Artist Piano Bench is up there among the best piano benches ever made. Piano benches are a vital part of every pianist. Making a wrong decision will not only make you uncomfortable but could potentially ruin your entire performance. With the above benches, we have made the decision much easier for you. Instead of having to choose one in dozens you can select any of the three discussed above, and you are guaranteed of comfort and durable performance.